Hello World - Tips and Tricks! So the V-One just arrived at your door and you can't wait to get started. Follow along our tutorial at voltera.io/start to print your first circuit. Do not disassemble the probe or tug on the metal tip. Doing so is an effective way to ruin the probe calibration. Be gentle with the nozzles. They are fragile and will break if you are not careful. Remember to flip the board upside down when you start the bake cycle. Ensure you burnish the baked ink using the provided burnishing pad (the white sponge) before soldering. If at any point in the process you have any questions, feel free to shoot us an email, make a post here or create a support package directly through the software. If you made it all the way to the end of the tutorial, please let us know! We'd love to see your Hello World blinking back at us. Upload a picture here or share on social media! They rotated a bit lengthwise (axial) and therefore are not completely flat on the PCB. Any tips to keeping these components flat on the board during reflow? We have noticed that these LEDs seem to move around a bit during reflow, though they still make a complete solder joint. The rotation is likely due to an imbalance in the wetting forces between the solder, pad, and component leads. Cutting back slightly on the amount of solder paste deposited on the LED pads (using the +/- buttons while printing) may help keep them from 'floating' while the solder is melted. Another issue I notice is that the pads end up with a small bump in the middle from the conductive ink. Don't know if it's the fact that it partially overlays the trace, causing part of the pad to have more ink, or if it's like a soft-serve ice-cream cone effect as the dispenser moves up and away. At any rate, that seems to make my LEDs tip to one side during reflow, as they are essentially balanced on the tip of a small cone. It also makes the 555's adherence very fragile, as all eight pins end up with minimal surface contact with the pad. Any thoughts on how to make the pads flatter? We're looking into ways of adjusting the path planning to trying to make the pads flatter. One thing you can try to help with pad flatness is to reduce the print height. In the calibration step, click on the advanced settings hyperlink. From here, you can lower your height by choosing your increment size and clicking the - button on the right. You should see the new height update beside Z: on the left side. I wouldn't recommend reducing your print height below 0.05 (50 micrometers). Make sure that you go through the calibration step with this setting, since the trace width will change when you reduce your height! Has anyone else had a tiny gap in the ground trace running along the bottom of their circuit, right below the 180Ω? I'm guessing this is beyond repair. Not a big deal – that's what tutorial projects are for, after all – but is the team aware of the software issue? Any advice for how to repair future open traces for baked ink, in general? I ran into the same issue and I believe the answer is to selectively reprint just that small section to bridge the gap before baking. I also recommend reading the section on manual soldering on the web site if you haven't already. I wish I had before I tried reworking my hello world circuit. It is possible that an air bubble was trapped in the nozzle and got pushed out during the print. Resulting in a gap in the trace. Air bubbles are common during the first print after installing a new nozzle and disappear in subsequent prints. What version of the software are you running? In the v0.7.0 that particular trace should be printed as a straight continuous trace and there should be no noticeable pause. We just finished the hello world circuit, my first project on the Voltera One. We're having quite a time here at 33C3 in Hamburg, a sold out 12,000-15,000 (?) hacker conference. Mitch Altman is presenting his solder workshop but we've gotten some eyes on the printer too despite his fame. 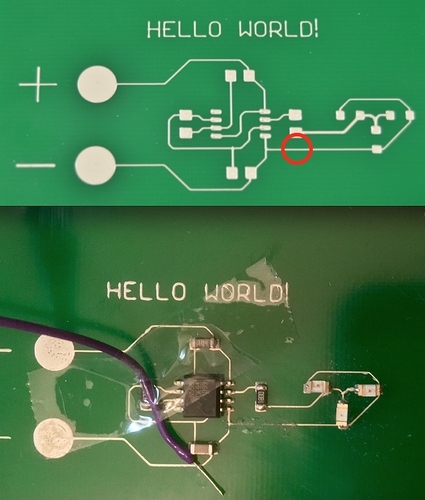 Can somebody confirm that touching the 9V battery to the terminals should immediately light all three LEDs, and then they go out after one second and nothing else happens? The LEDs should all flash together, around twice per second on mine. I see these are all 8-SOIC which seems correct, but some operate at 100KHZ and others at 500KHZ. The footprint sizes are also different, with some measuring 5.3mm and others only 3.9mm. The difference is small enough (and I don't know how to measure a 555 timer anyway) that it's hard to compare with what Voltera sells in the hello world kits. If I want to buy the same thing that comes in the hello world kits, which model should I buy? Hey Michael! The one we use for the Hello World kit is the TI NE555PSR. I ran into this same problem but just simply wired around the gap probably not the most elegant solution but it worked.